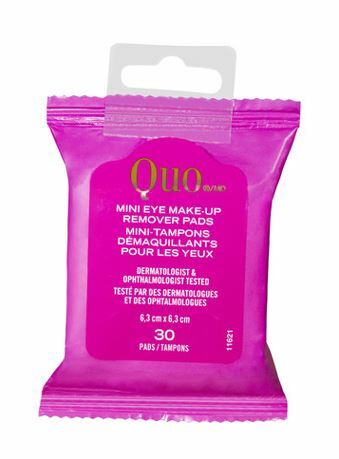 Head to Shoppers Drug Mart Canada this week, and you can pick up these Quo Mini Eye Make-up Remover Pads for free after points1 This week, several Quo cosmetics items have a bonus of 10,000 PC Optimum points when you buy two, including these make-up remover pads, priced at $5. Purchase two for $10, and get 10,000 PC Optimum points back, making them free. You will pay just the taxes. They are out of stock online at BeautyBoutique, but you can probably find them in store if someone hasn’t beaten you to it. Don’t forget that until Monday there is also a bonus redemption, and you will also get these bonus points if you redeem. If you are able to find enough product you would be able to redeem 60,000 points for $80 off, and you would get 80,000 PC Optimum points back if redeemed on 16 packages of these. Click here to view the Shoppers Drug Mart Canada flyer for this week. Any time I’ve redeemed points I’ve never had any ‘in-store’ points work. I just redeemed the point amount but regardless of other offers never received any points back. Is the above true? I can purchase the wipes with in-store points, redeem the 60,000 points but still receive the in-store points? What about app offers? I have an app offer for 30x wys $50 and might find it easier to locate a store with $50 in wipes.